Gina Litherland, Tea Leaf Reading (2014). Oil on wood, 12″ x 9″. 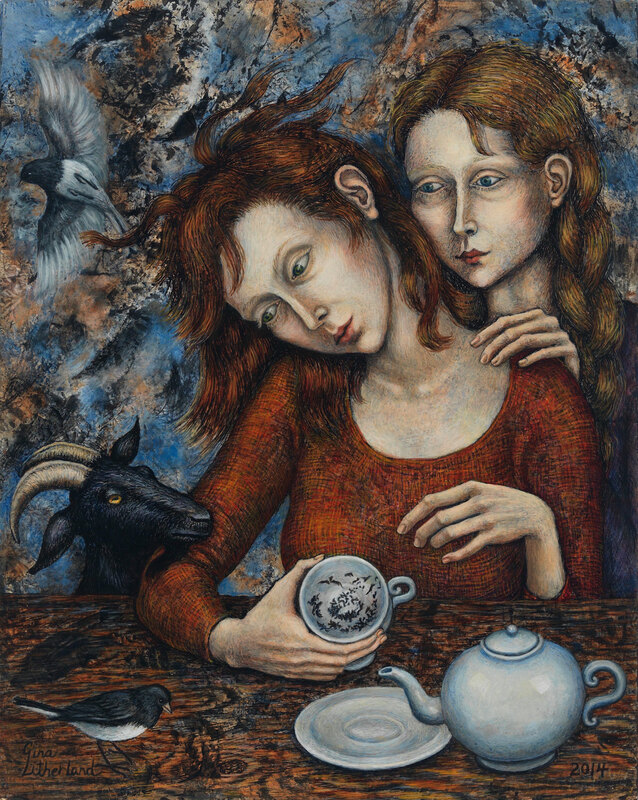 © 2014 by Gina Litherland. Permission to reprint may be obtained only from the artist. This work appears on the Autumn 2018 issue of Signs. Since I was a child I’ve been enthralled with folktales, myths, and literature, and these have been a major source of inspiration in my work. Children’s games, old theater forms like puppetry and opera, traditional British folk ballads, divination, superstitions, the human/animal boundary, and the natural world also come into play in my work. I work with oil paint on wood panels, and begin with a monochromatic underpainting, successively building up layers until I’ve reached the desired amount of clarity and contrast. I also sometimes use a decalcomania technique by stamping various colors onto the panel, and letting the textural forms suggest images to me. From the developing image, a narrative forms. This can be a very satisfying way to work, and often the most revelatory. A world emerges out of nowhere. Gina Litherland was born in Gary, Indiana, and has been active in the visual arts since the mid-1970s, exploring photography, performance, drawing and painting. She studied at the School of the Art Institute of Chicago, and her paintings, drawings, and articles have been published worldwide in journals and periodicals. Her essay on the connections between creative activity and the natural world, “Imagination & Wilderness,” appears in Surrealist Women: An International Anthology, edited by Penelope Rosemont (Austin: University of Texas Press, 1998). Litherland’s work has been the subject of museum exhibitions at the Haggerty Museum of Art in Milwaukee, the Caestecker Gallery at Ripon College, the James Watrous Gallery of the Wisconsin Academy of Sciences, Arts, and Letters, and of several solo exhibitions at Corbett vs. Dempsey Gallery in Chicago, most recently in 2016.